The Miro C small rent apartment Barcelona is located in the Barcelonese Eixample area in a modernistic building with an elevator. This small rent apartment Barcelona is a studio apartment which consists of one master bedroom, a living room with a double sofa bed, one bathroom, a fully equipped kitchen and a balcony. The small rent apartment Barcelona is very central located. The metro station is only 200 mtrs. away and only 1 stop from Plaza Catalunya. In Plaza Catalunya you will find many shops and go to Paseo de Gracia for the famous designer shops. 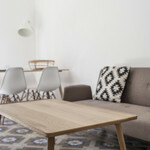 If you are looking for a good located small rent apartment in Barcelona it is definately worth considering.